PhotoPlus Panel: Why Licensing Matters (10/31/11) so I won't recap their piece except to encourage you to read the review and learn a few of the tidbits that you missed if you weren't in attendance.) PhotoPlus Panel: Why Licensing Matters, summarizing the presentation by saying "making extra money on photographs you’ve already taken, that’s just a smarter way to do business." On the technology side, several companies caught our attention. First up, is the company ikan, which has an amazing array of CLS lighting. Just when you thought you had every strobe you needed, all of a sudden you're now "shooting just a little bit of video" for that still client (or branching into multimedia all-together) and realize that strobes just don't do it for your video needs. Enter CLS, and ikan, with amazingly reasonable prices on their lighting products with blindingly bright LED units that are small and mount on camera, to 1' x 1' units that seem like they could burn out your retinas. Sure, they also sell camera cradles, bags, and countless other production tools (all with a craftsman's approach to quality), but the lighting, that's worth a long look, because you'll never have to suffer under "hot lights" again if you go this route, not to mention these LED's are battery-powered and highly efficient, so that means no blown circuits with a few hot lights plugged in! Our go-to source for these units is Mac Business Solutions, which is a top-end boutique for all things mac (from computers to still gear to video, to, yes, even high end printers). Be sure to ask for Sonny, the owner, when you call. Next was GoalZero which has some amazing portable battery power. We picked up a set of these packs, and have used them to power dying laptops, and hope to use them to power our ikan lights when they arrive! Not only can they provide a wide range of power, but they also have portable, small, and efficient solar panels to recharge your kit. No more looking for a shack with a bunch of car batteries when you're in the middle of nowhere to charge your gear. These babies do the trick. 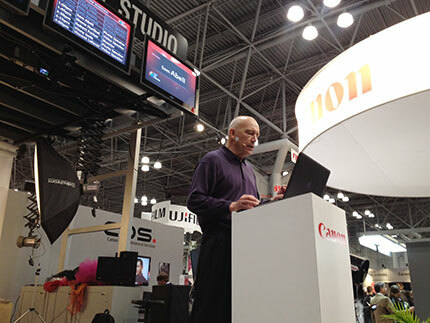 A worthwhile presentation was the always enlightening Sam Abell, who spoke at the Canon booth. If you missed (or didn't want to pay for the 3 hour seminar (which you should have if you'd have had the option), Sam Spoke for a brief period of time at the Canon stage, and if you couldn't make it to NYC, Canon was saavy enough to live-stream it. Suffice to say, I'm biased when it comes to Sam, but his stories are always so engaging and inspiring. Rumor has it he's in the Amazon working on a book project, so stay tuned. 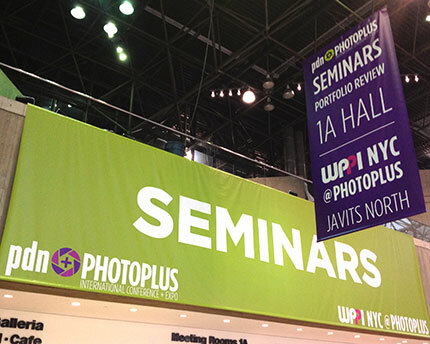 All in all, I was impressed with the integration of the WPPI portion of the show, following the merger (or aquisition?) of WPPI by Neilsen/PDN, which was announced at the 2010 show. Well done, integrators. The show was, as always, not to be missed. If you did, don't miss it next year.